Publisher’s Note: Tom Console is a ‘multi-dimensional’ gambler. He plays any game of chance where he feels he can enjoy an edge. 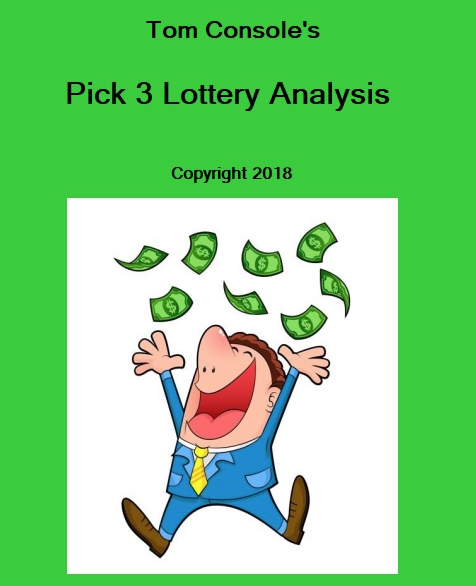 He does this by doing extremely thorough statistical analysis and only proceeds if he can ‘prove’ that his analysis will make a profit – and in this case, he has literally cornered the market on the State Pick 3 Lotteries. 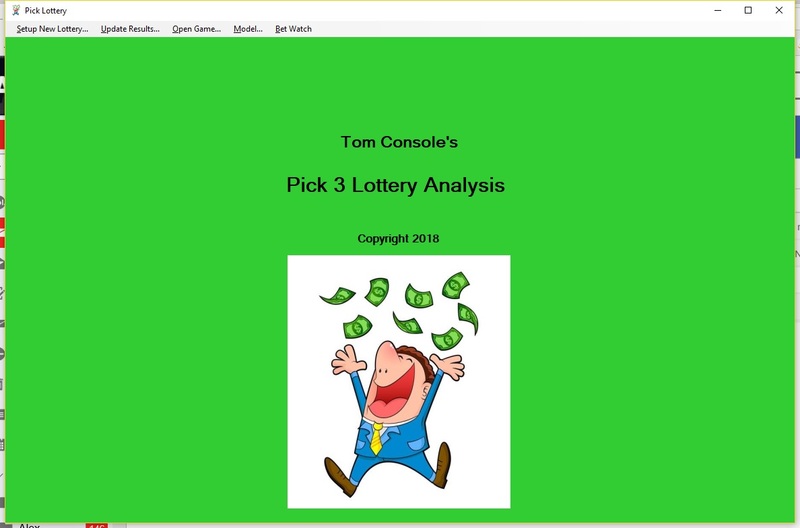 Tom has delved into the State Pick 3 Lotteries previously and has continued to improve his one-of-a-kind Pick 3 Software to the point where it is now actual ‘Science’. 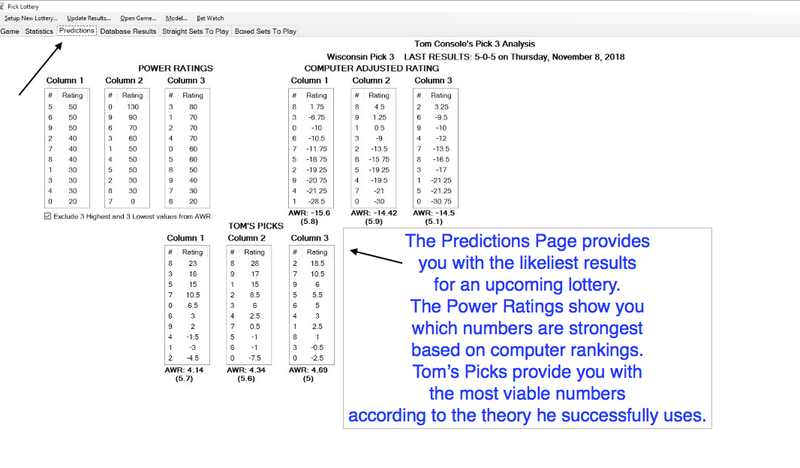 As Tom tells us, the Pick 3 has two major advantages over the other types of Lottos: 1) The Pick 3 is beatable – with proper statistical analysis that recognizes patterns in the drawings and, 2) It costs just pennies to pay and the rewards are often outsized — often you will have a winning ticket several times when playing ‘boxes’ as the software instructs. Give it a try — the program does all the work for you. You simply play the suggested tickets and wait for the results! It’s that easy! The Only Beatable Lottery Game – The Pick 3! Tom, by his own admission, has undergone a lot of changes recently. Things he used to blow off as ridiculous, like using a measure of Astrology or Numerology in his handicapping, he now takes a serious look at. in most states these days! —–Welcome to my Pick 3 lottery program. All of us have that dream of just one time hitting it big in the lottery. Waking up one morning, checking our tickets, and finding 6 correct numbers that will make us instant multi-millionaires! Unfortunately, I can’t help you with that. Like you, I will continue to have that dream, and hope for the best. We all know deep down we probably will never hit that huge jackpot, but hey, for a few bucks on some tickets, it’s worth it just to be able to keep the fantasy alive. What I am hoping to help you with is hitting a lottery jackpot on a much smaller scale. The $500 “grand prize” of the Pick 3 lottery. I never used to pay any attention to this lottery. After all, who wants to win the GRAND PRIZE in the lottery, and yet it’s not even enough to pay for a month’s groceries? That was my thinking until something odd happened one day at the store. ****He went on to tell me that he plays about $30 per day on average. Some days he gets $10 or $15 in tickets, other days $60 to $70. But $30 on average. He plays every day, 25 days a month. So he bets about $750 per month. That woke me up! The one lottery I laughed at all these years was probably the ONLY one I should be playing. So I spent the next 3 years testing “theories” and “systems”. I bought just about every system on the market. Some were very good, except you had to win 33% of the time to break even! Others were decent, but you had to play 50 or 60 sets of numbers, and you would not hit very often. And of course, many were just a bunch of garbage, with some crazy idea to add this to the last number, or subtract that and invert the other. Made no sense at all. So like always, I figured the only way to arrive at something I may feel comfortable with was to do it myself. I tested so many ideas that it was crazy. But I guess I am a bit crazier than that, so I never gave up. Finally, after over 3 years of testing and retesting, I settled on 4 methods. Then I had to decide which one to use. Which should become my software program. I decided to use all 4. So the program you now have has all 4 of my BEST Pick 3 lottery methods I developed over the past years. I scrapped the so-so and poor ones, and just kept the cream of the crop to incorporate into this amazing program! And as you will see, the word ‘amazing’ is no exaggeration. Below is an example of the ‘Calendar’ feature from lotterypost.com. 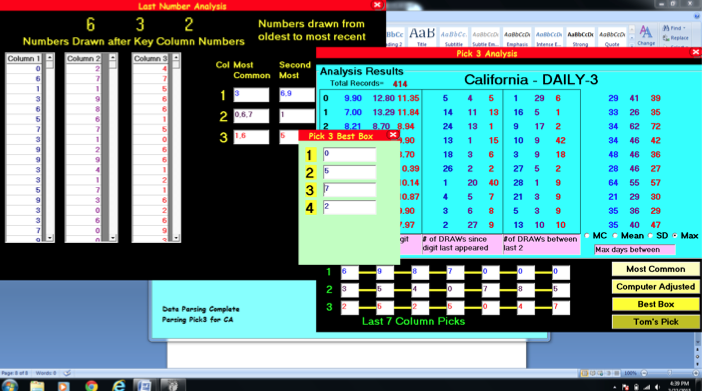 This example is the October results of the California Pick 3 drawings, two per day. It shows the numbers drawn for both Pick 3s both days. This is the information you will input to build your database. The program makes this very easy — you can build a 6-month database in roughly 30 minutes. And once you have a good-sized database, which costs you nothing, by the way, the Magic begins to happen! Tom discovered that ‘randomness’ does not have as much to do with these smaller lottos as he had once thought. With the software you can download/input as many days/games as you want – once you have 6 months worth or more, the data will be extremely accurate. You will be provided with the numbers that appear most frequently. The very first Arizona Pick 3 that Tom played using the software hit for $500 (he played two numbers in each position). If you are a regular Lotto player, your chances will definitely be enhanced by this software. it examines a long-term database for the state you are playing and shows you the numbers & patterns that hit most often. “The State Pick 3 Lottos offer the best opportunity to actually make a PROFIT from these games”, Tom tells us. “And the notion of ‘randomness’, which is always the explanation of why you can’t win, is way off base when you are talking smaller combinations of numbers. you NOW can RELY on a Sophisticated Software Program to guide you to a much more likely positive result. At the top of this screen we showed you the lotterypost.com database where you will get your data. This is a FREE service. You simply select the State(s) you want and you can get up to two years worth of results that you can build your database with. Open Main Screen – this screen provides you a variety of data, including how often certain numbers hit, how long it has been since a certain number has hit in a certain position, etc. This gives you a good idea of which numbers are ‘due’, so to speak. 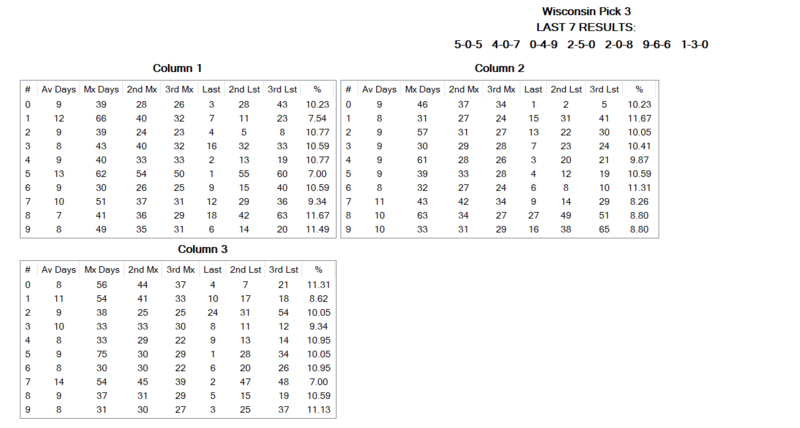 If you look at Column 2, for example, and look at the ‘Last’ column for #8, you will see that it has been 27 days since the #8 last hit in the 2nd column on this state’s Pick 3 — so, you may want to focus on the #8 in this column since it is ‘overdue’ to hit. For those of you who like to do precise analysis, it is all here. But if you want to just go straight to the ‘Picks’ Screen, see below. 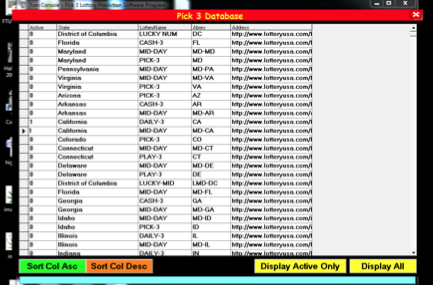 Below is the screen that will provide you with the ‘Best Box’ based on analysis that covers thousands of Pick 3 Lottos in your state. Now, you can also play a ‘straight’ ticket, which is also shown on the screen, like 9-6-7, or you can go to the ‘Tom’s Pick’ screen which offers tighter statistical selections. >>‘Tom’s Pick’ Screen. Here’s how Tom recommends using this screen: The last set of picks are called Tom’s Pick. This is the other selections I personally use. Click on this and a new screen shows up. It will list the numbers, 0 through 9 down the side, with the 3 columns again. HIGH is best. You will see many negative numbers, and some positive. I left the negatives to be able to easily see the highs and lows. So on this, I use a little judgment. I look for the top 1, 2, or 3 numbers in each column. Sometimes I just use 1 number if there is a good gap. Sometimes 2 or 3 if there is no gap until after those numbers. In column 1, for example, #8 is the highest, #3 the second highest and #5 the third highest. In Column 2 #8 is the highest, etc., and in Column 3 #2 is the highest. >>So the computer is telling me that 8-8-2 is the optimum play according to its pattern recognition analysis. However, it is always best to play a few tickets and what I normally do is take the top 3 in each column and play the possible combos — 8-8-2, 8-9-2, 8-9-7, 8-9-9, 3-8-2, 3-9-2, etc. If you play all of the top three number combos you are talking @$14 in 50 cent tickets, or $7 if you play 25 cent tickets on the Five Dimes website. >>If your numbers hit, in most states you are talking winning between $250 and $900! Model: Provides a ‘model’ of 10 Boxed sets that have most frequently hit, when they hit and if they are due. Bet Watch: Provides the ability to instruct the program to ‘play’ the listed boxed sets (which are derived from pattern hits) beginning at any given date and it will show you when and if any of these boxes have hit. You can focus on boxes that have not hit over a long period of time that may be ‘due’. Best Straight/Best Box Bets: These are derived from the Tom’s Picks screen and arrange all of the possible boxes and best straight bets so you don’t have to do the work! And it is very reasonably priced at just $59.90. Scientific Analysis that will lead you to many more cash-ins. And, of course, it is fully guaranteed. Give it a try – Playing the Pick 3 Scientifically is the only way to Profit, and Tom’s Pick 3 Lotto Software shows you Exactly how to do that!